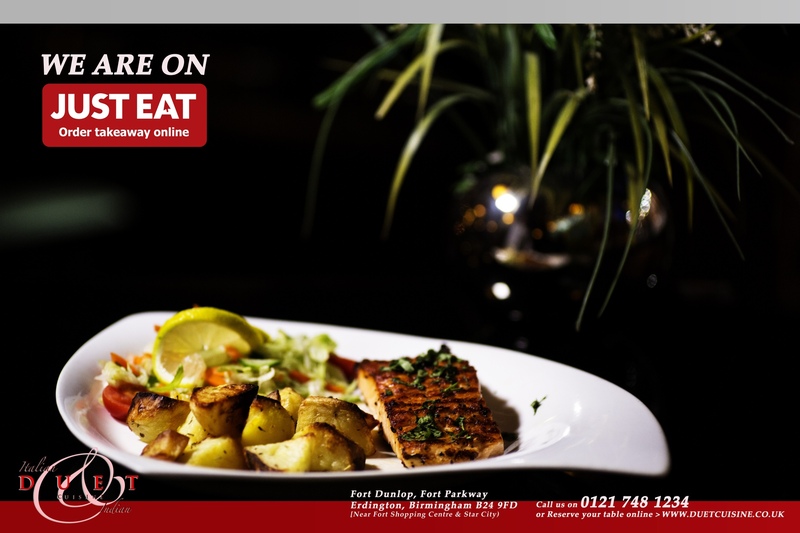 It is no great surprise to discover that there are Indian restaurants in Birmingham aplenty just as there are Italian restaurants, but rarely would one find a restaurant that proffers a taste of these two worlds so elegantly. 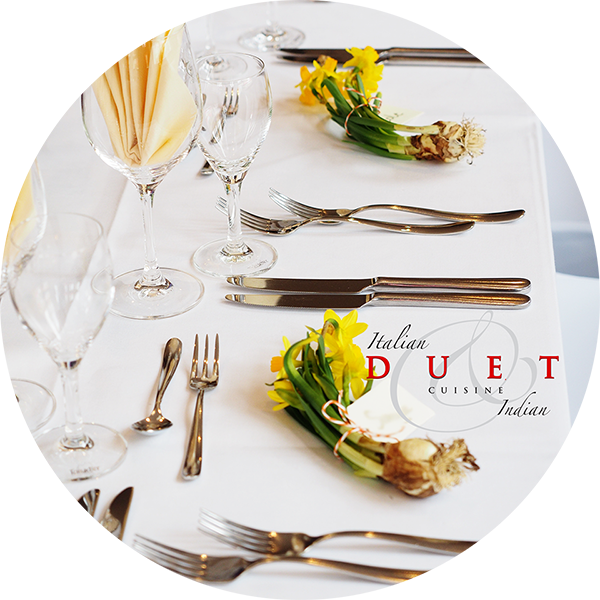 Until Duet Cuisine. 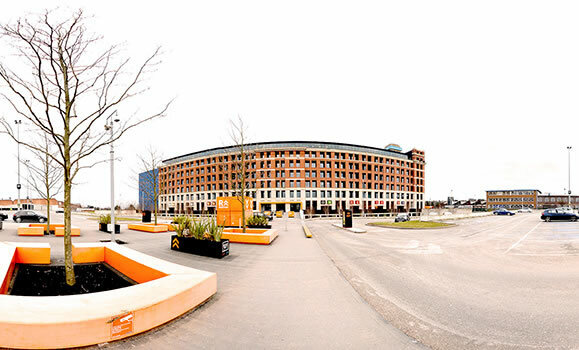 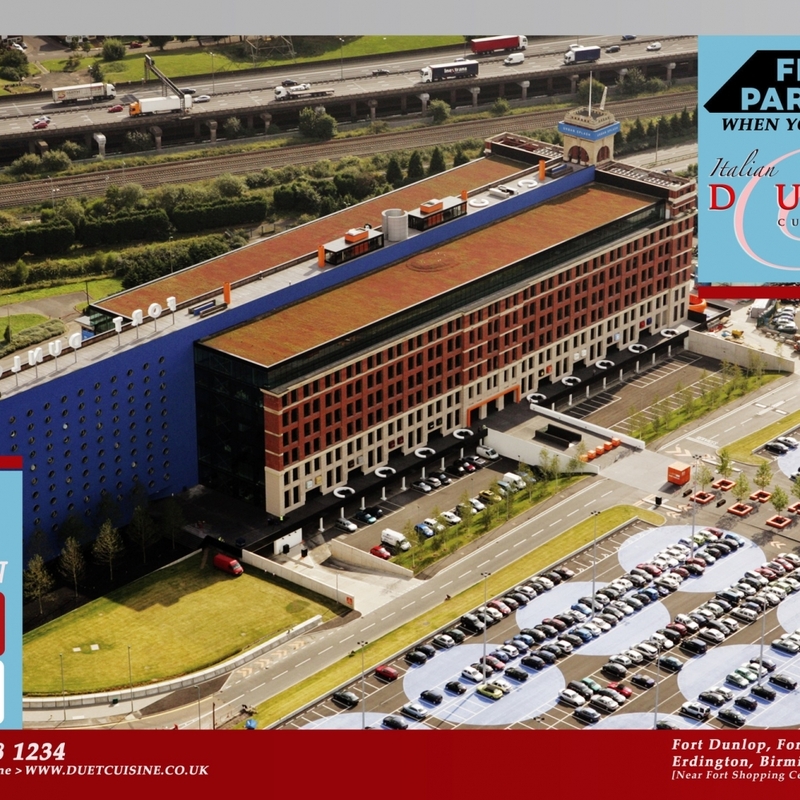 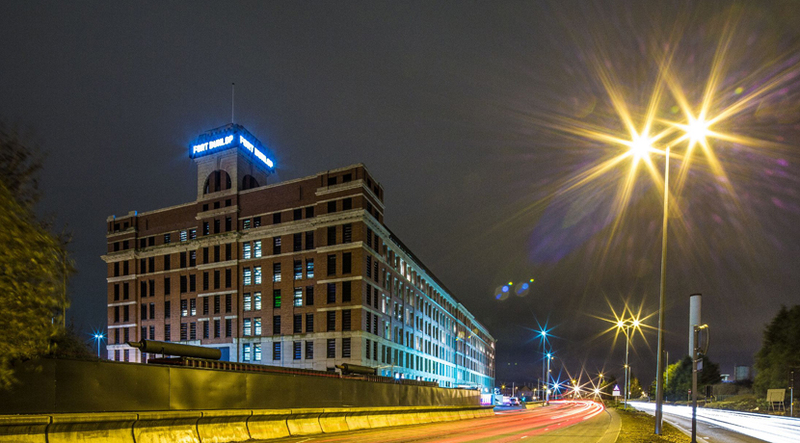 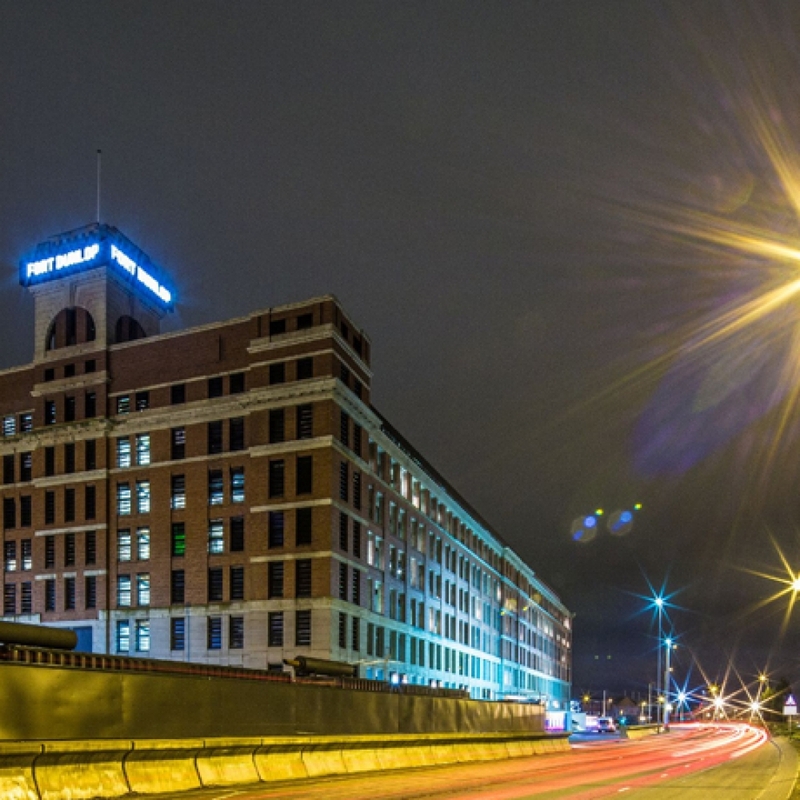 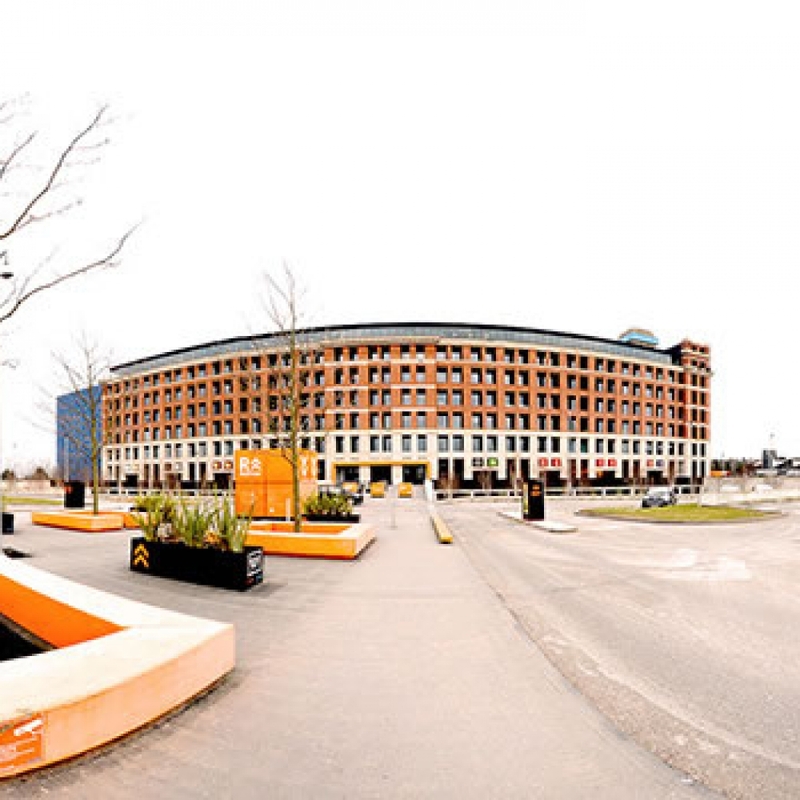 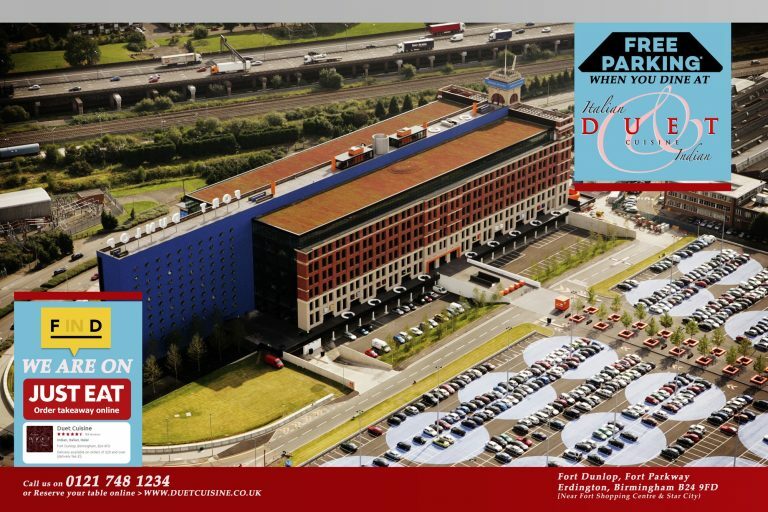 The regenerated Fort Dunlop is home to Duet Cuisine, a restaurant which brings together history and modernity as impressively as its surroundings. 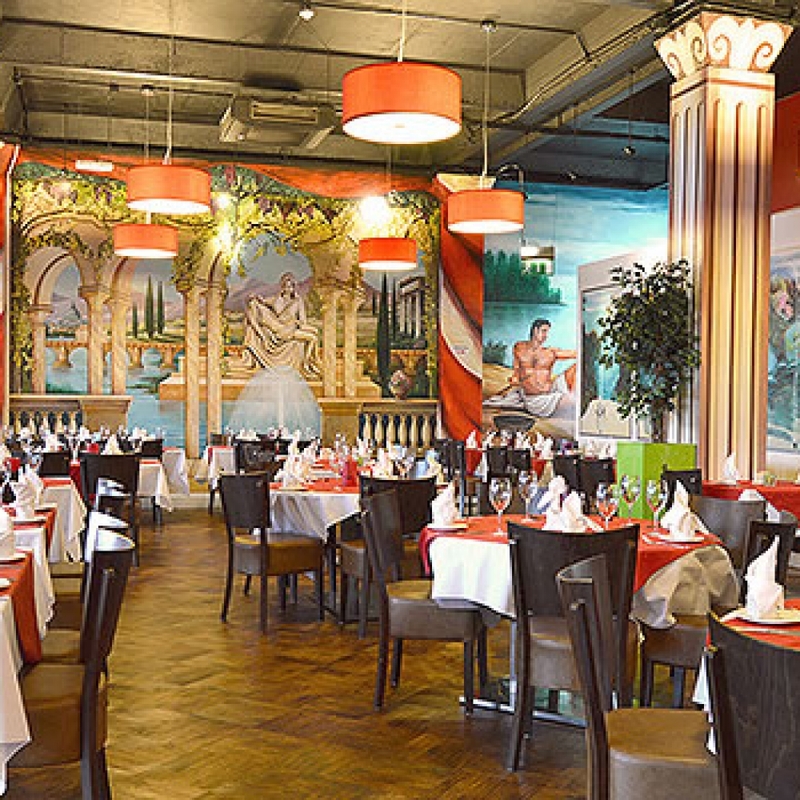 Here you’ll find two well-loved cuisines [Italian & Indian] living side by side in an attractive contemporary restaurant. 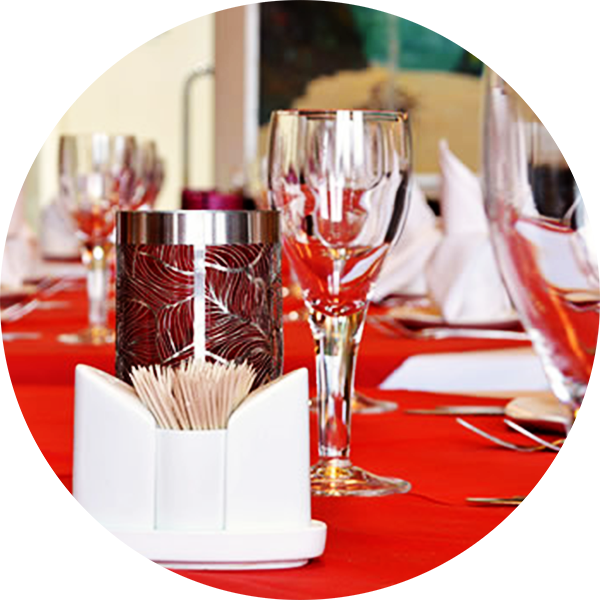 The airy warehouse space is relaxed yet formal enough for a business lunch or a date to impress. 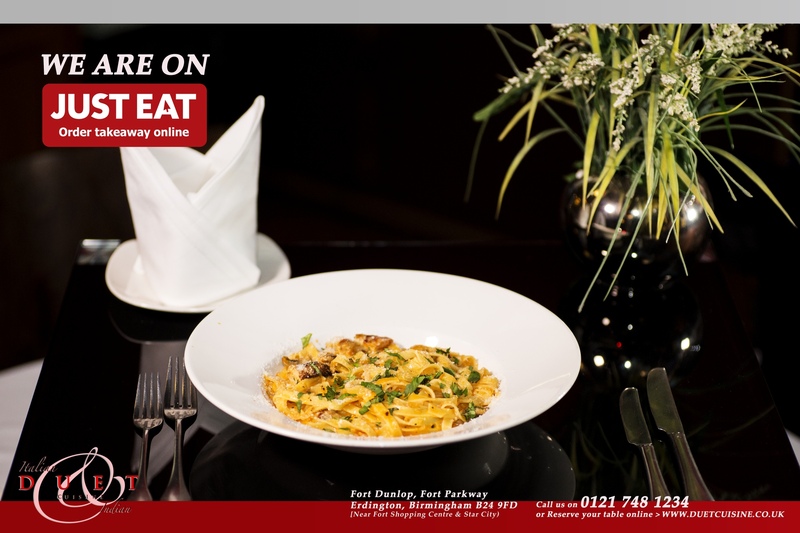 Meanwhile, that combination menu, created by two internationally acclaimed Chefs, allows for freedom of choice – ideal for when you want Indian but your friend fancies pasta? 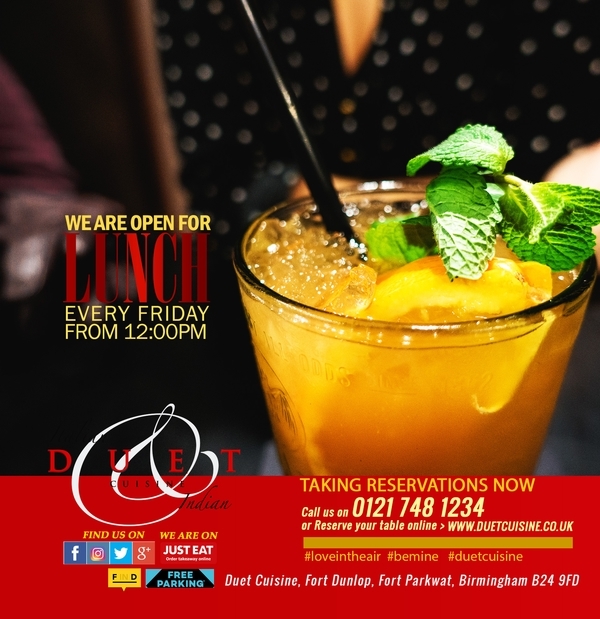 The extensive a la carte menu includes favourites such as Lasagne Al Forno and Chicken Tikka Balti while a lunch menu offers both cuisines with a creative twist on every Friday from 12 pm. 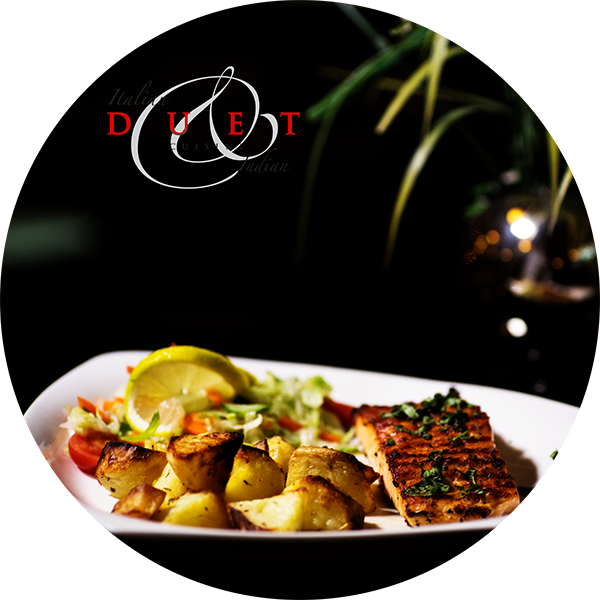 You want a meal that’s mouthwatering Mediterranean, but your partner prefers something altogether spicier. 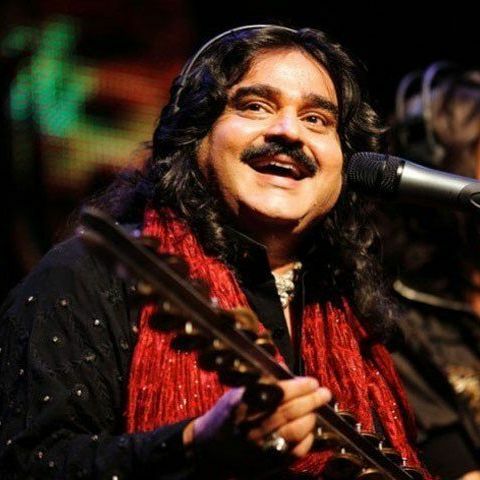 That’s where Duet comes in, with our unique choice of high quality Italian and Indian cuisine to suit a range of tastes. 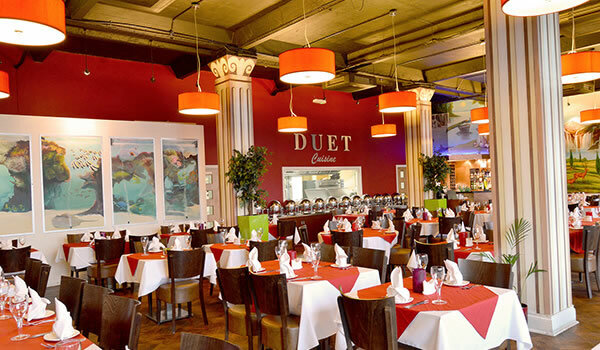 Duet invites discerning diners to join us in elegant and contemporary surroundings at Fort Dunlop’s funky and fashionable ground floor retail parade. 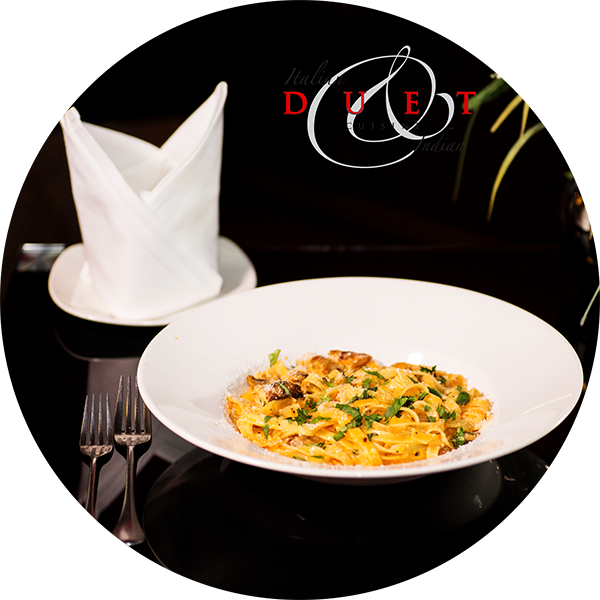 The Italian menu is no less exciting and varied with an assortment of antipasti, zuppe and insalate, perfect plates of pasta and signature dishes guaranteed to thrill even the most demanding of diners. 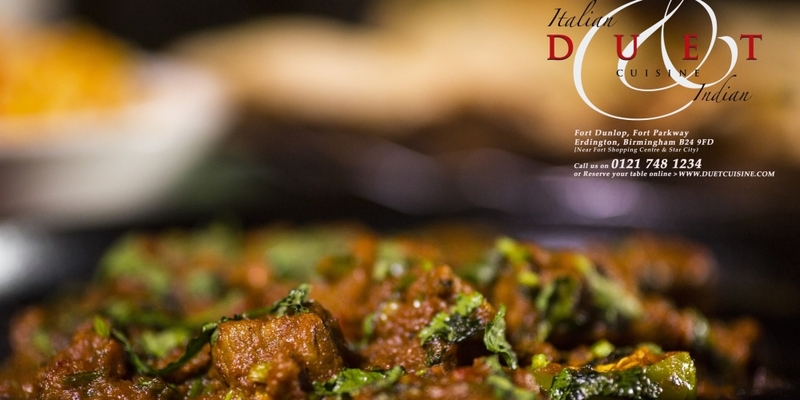 With traditional starters from this Indian menu such as bhajis, kebabs and more unusual Italian ones like various melt-in-the-mouth purees, through a wide variety of vegetarian and seafood surprises, to tasty tandoori and biryani specialities, the Indian menu is unparalleled in its diversity. 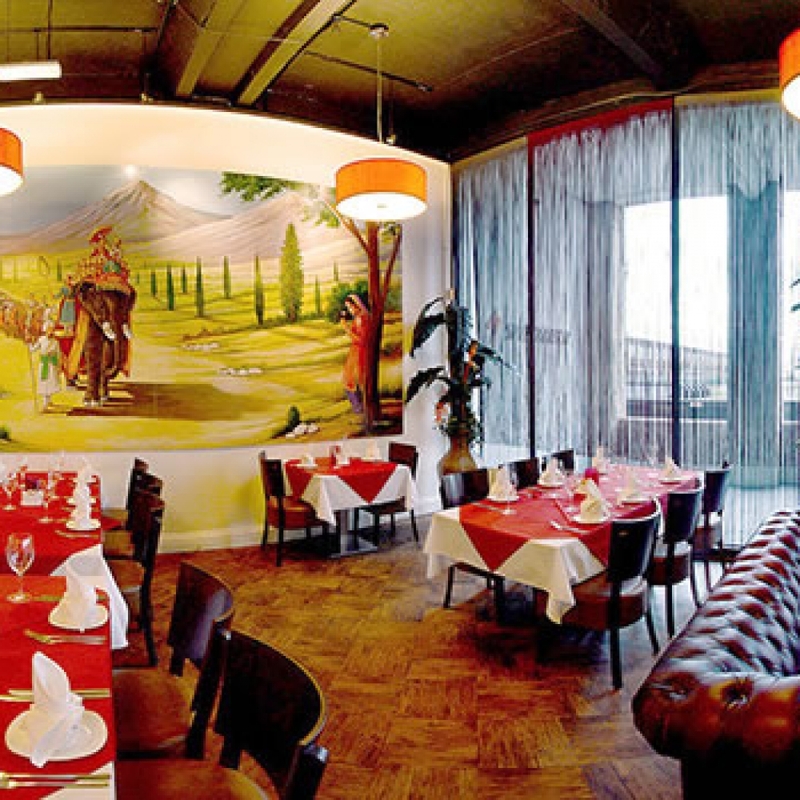 The airy warehouse space is relaxed yet formal enough for a Business Lunch or a date to impress. 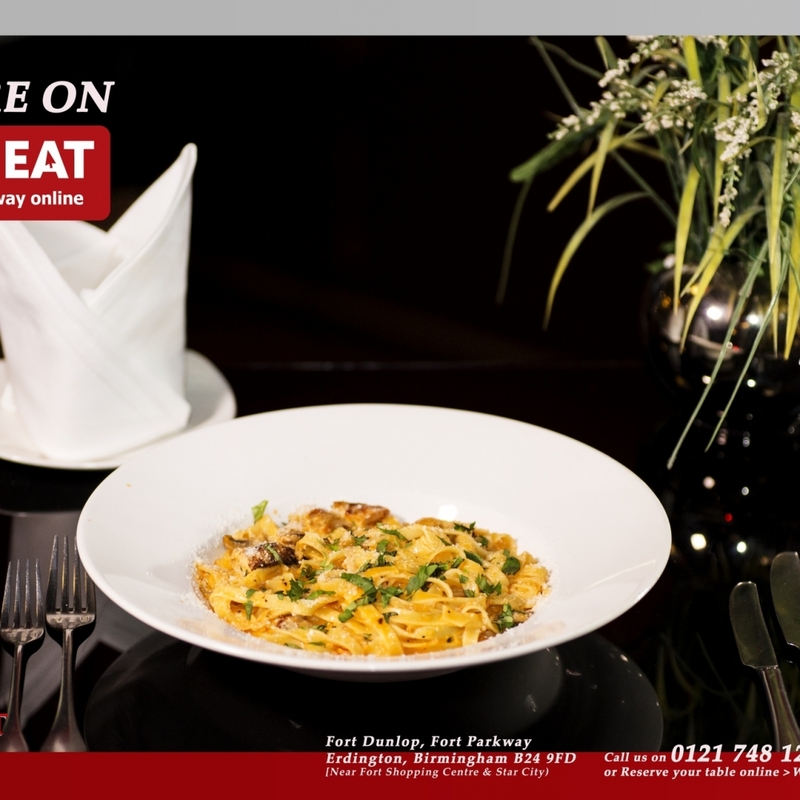 Meanwhile, that combination menu, created by our specialised Chefs, allows for freedom of choice – ideal for when you want Indian but your friend fancies Italian Pasta. 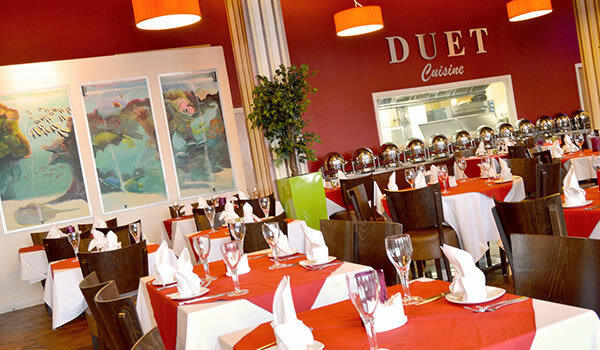 The extensive a la carte menu includes favourites such as Lasagne Al Fornoand Chicken Balti, every Friday from 12 pm. 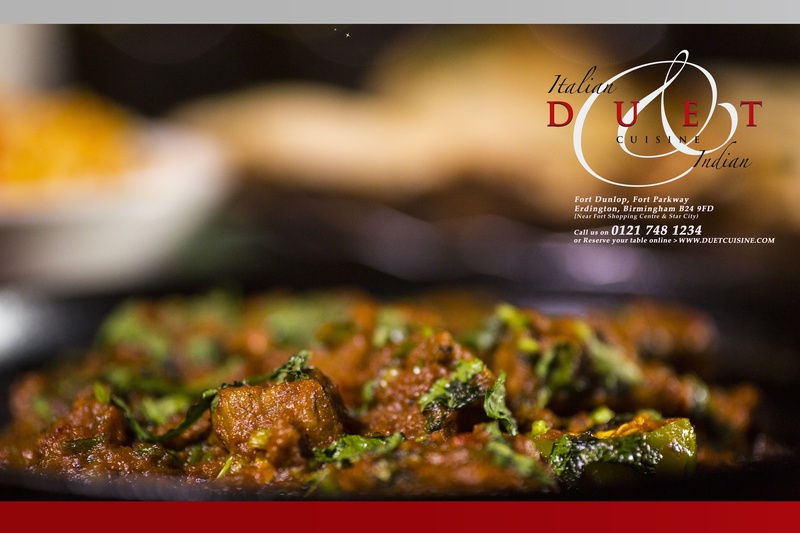 Enjoy our excellent selection of exquisite Indian and Italian menus, inspirationally created by our finest team of chefs. 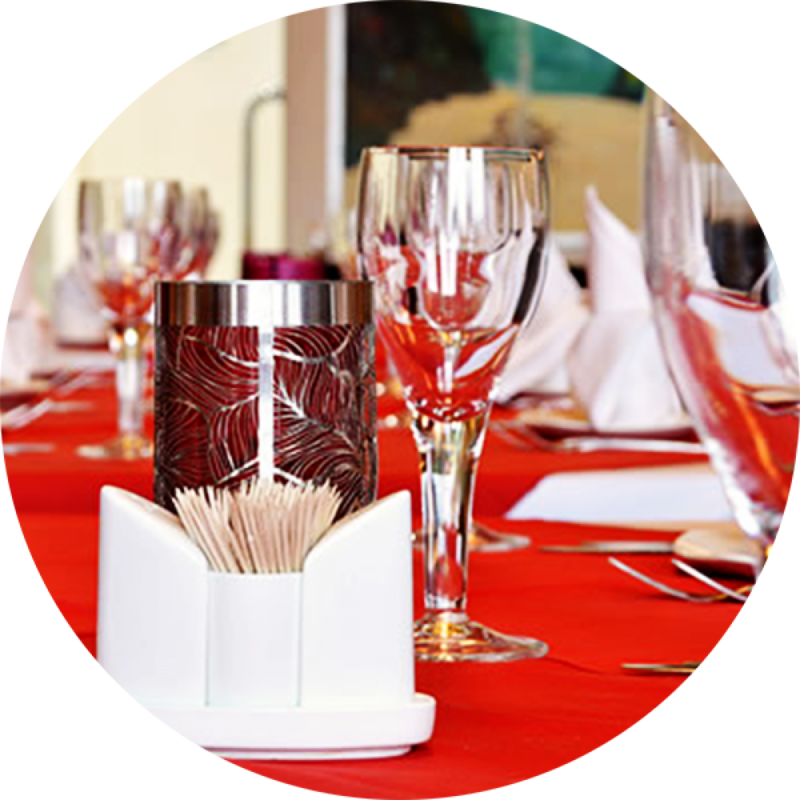 We offer a very competitive service and can arrange delivery of agreed menu on time at our restaurant or choice of your own venue. 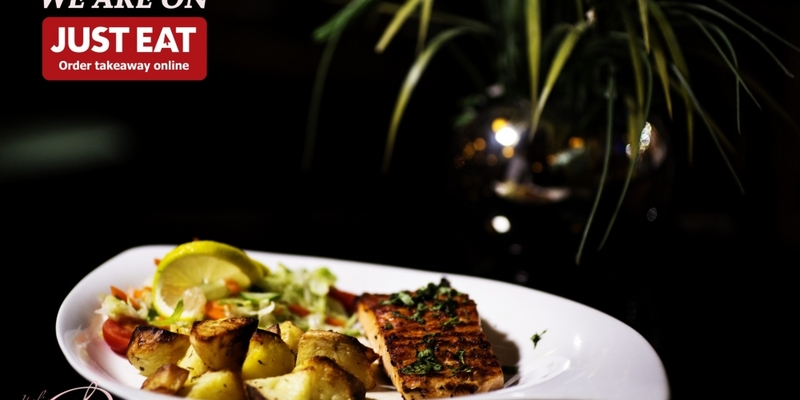 There are those special moments in life when there just aren't enough options to choose from. 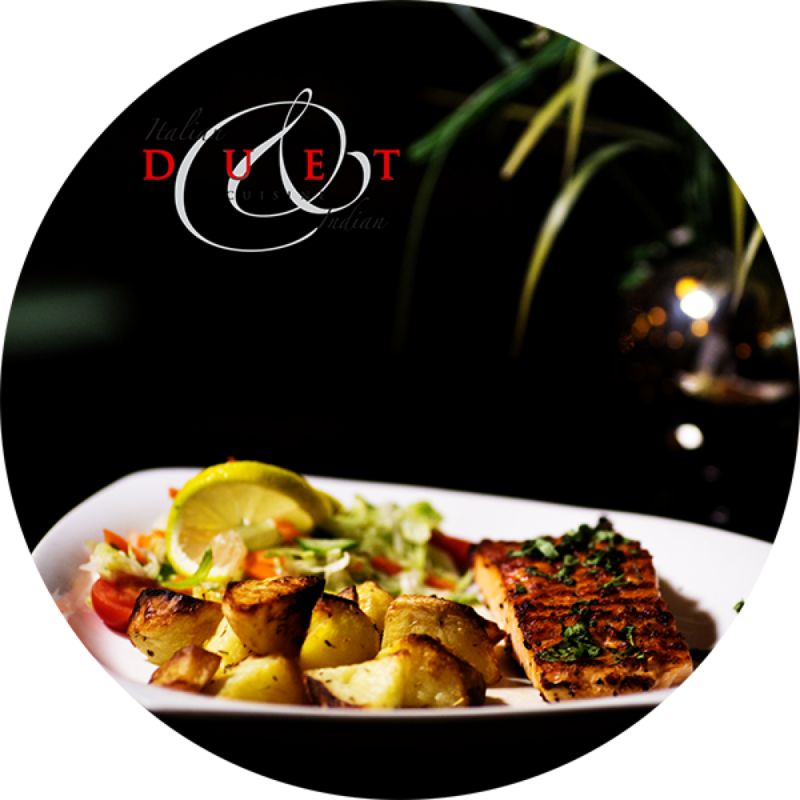 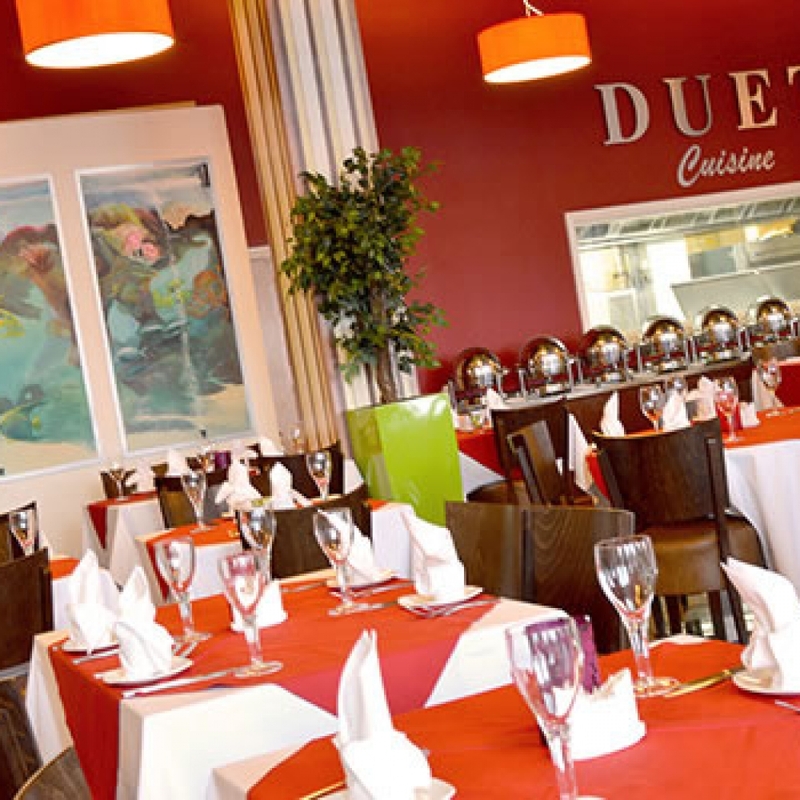 Well here at Duet Cuisine we have solved that problem and on offer, you'll find a dazzling array of both Indian and Italian dishes to satisfy even the heartiest of appetites. 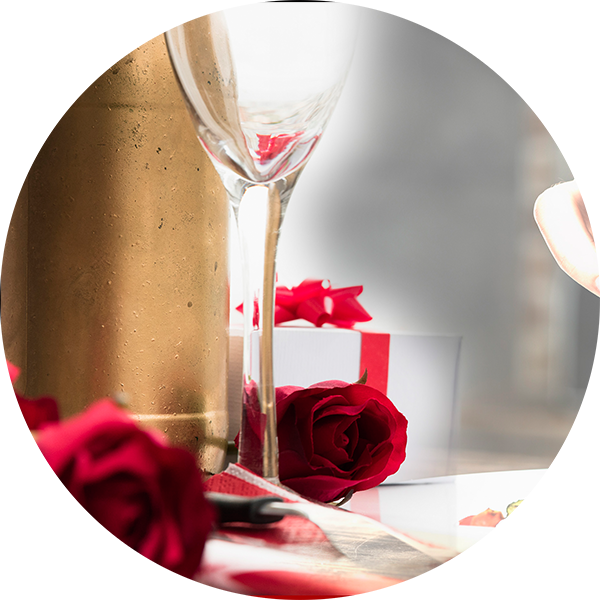 So celebrate with us those special festive occasions like Christmas, New Year and Valentine with choice of special festive menu. 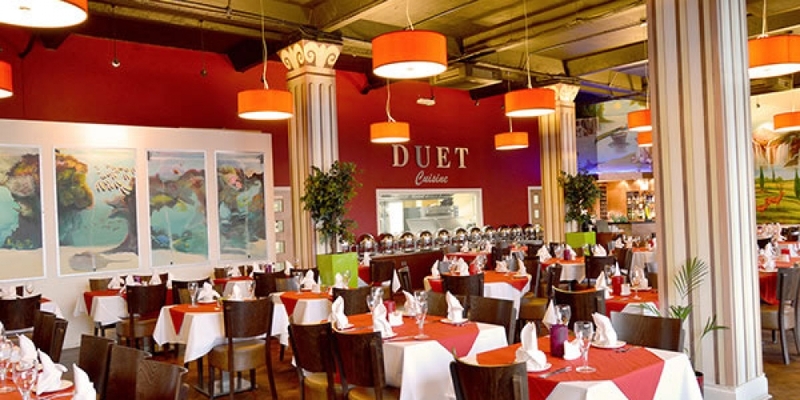 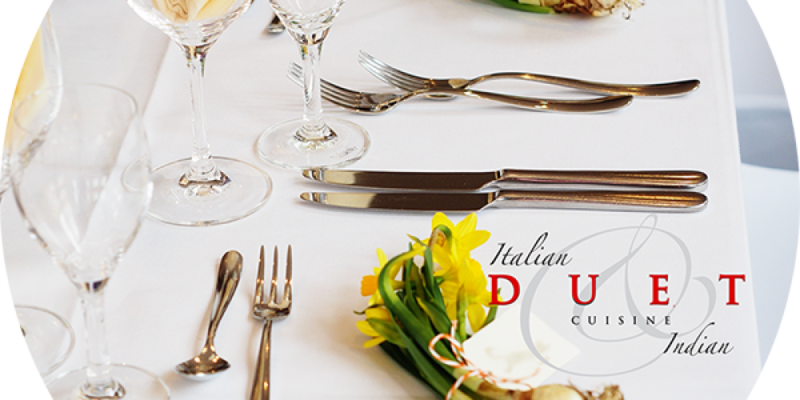 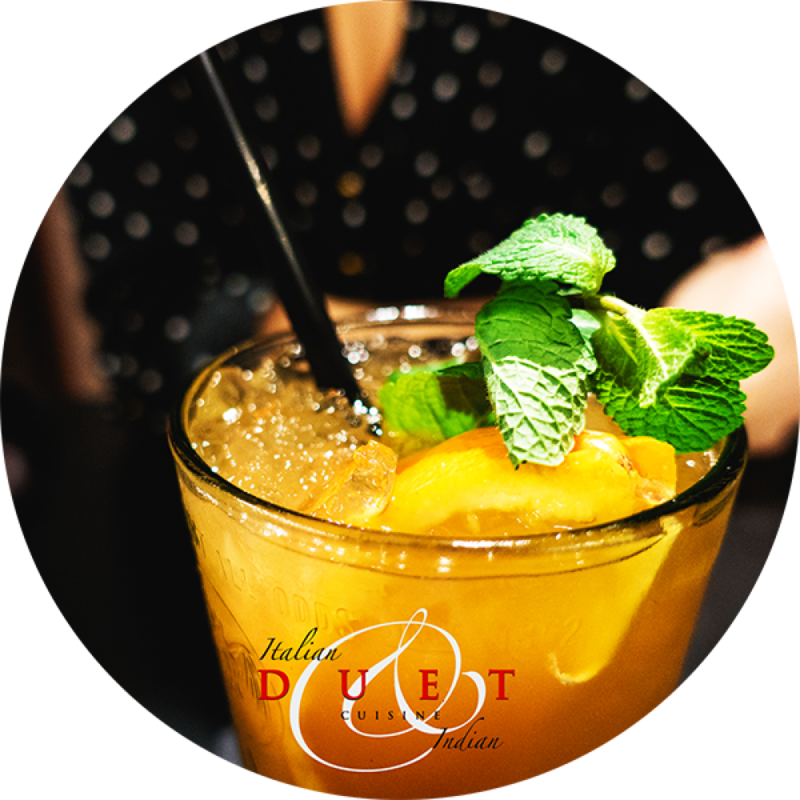 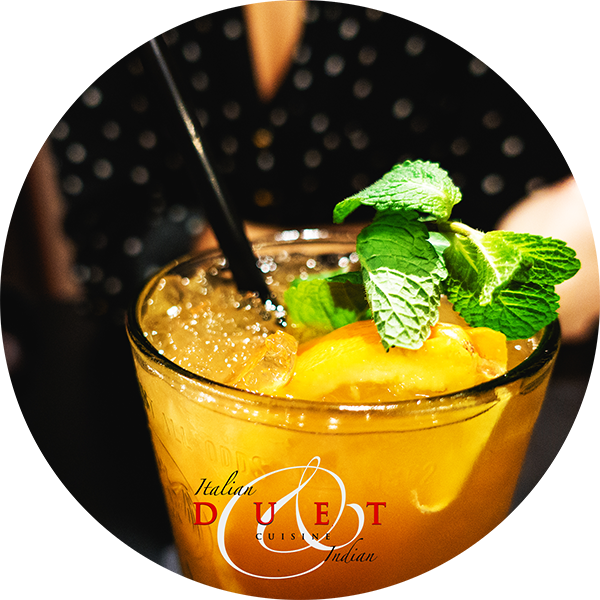 Duet Cuisine can be hired for a number of events. 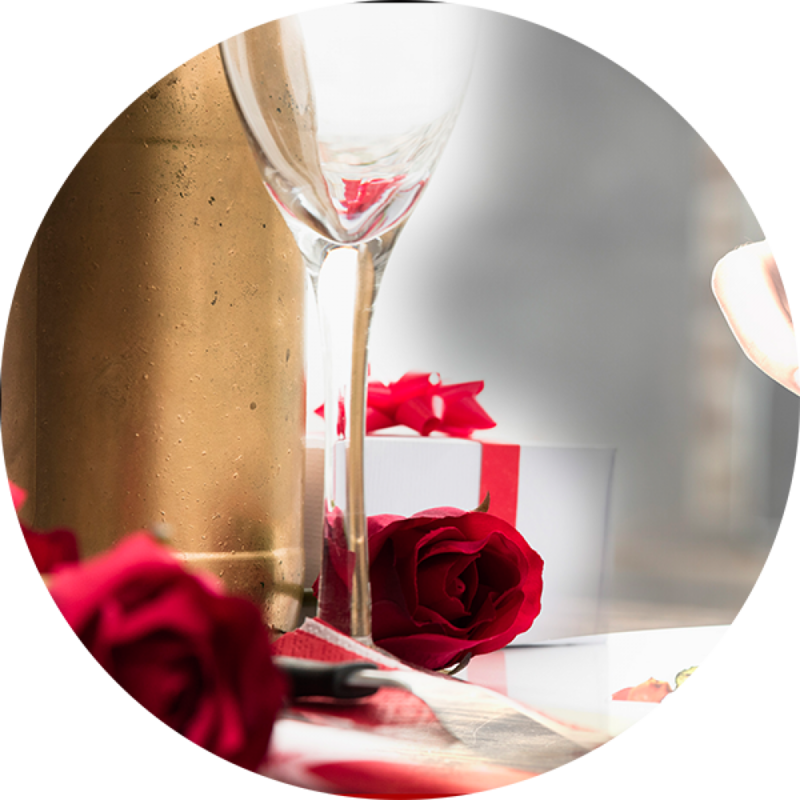 If you would like to plan an event or would like help planning the perfect evening for your guests, then get in touch with our experienced team who would be delighted to help and advise you. 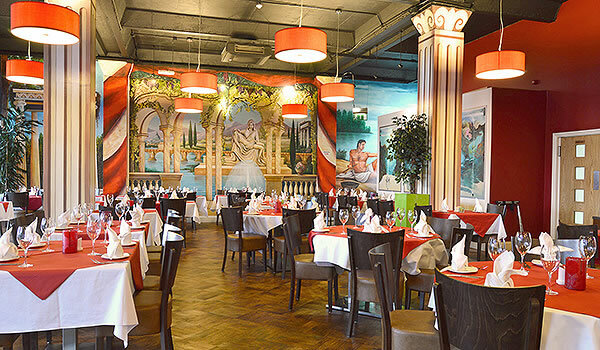 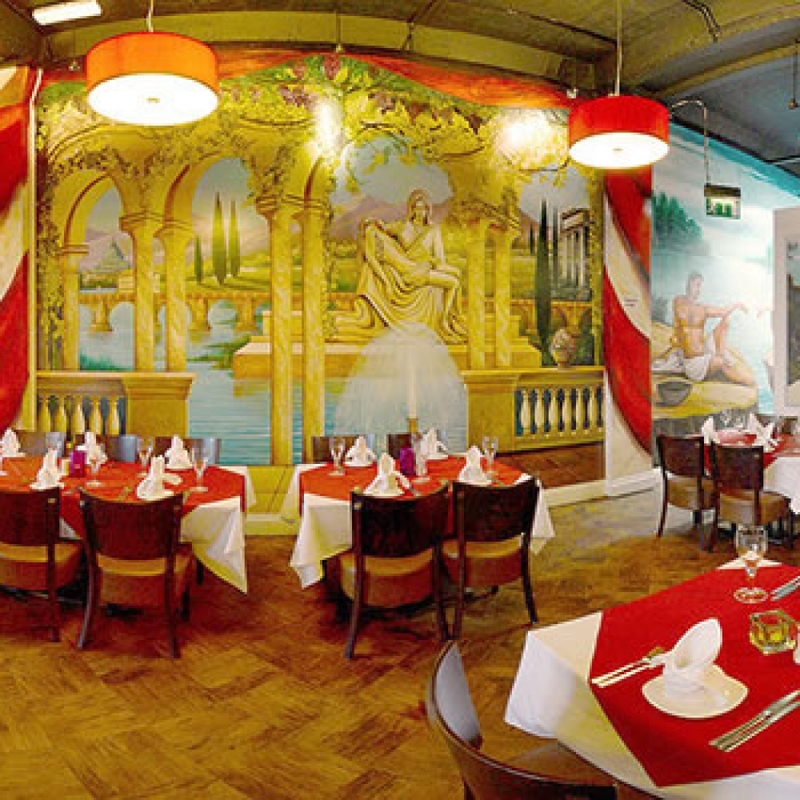 Spacious contemporary restaurant with vivid wall art, serving classic dishes from India and Italy.